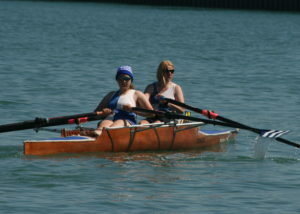 Sunday saw Dover Rowing Club’s Regatta held in glorious conditions within Dover Harbour. Despite the works currently taking place the regatta was over the full course, thanks to the assistance of Dover Harbour Board. 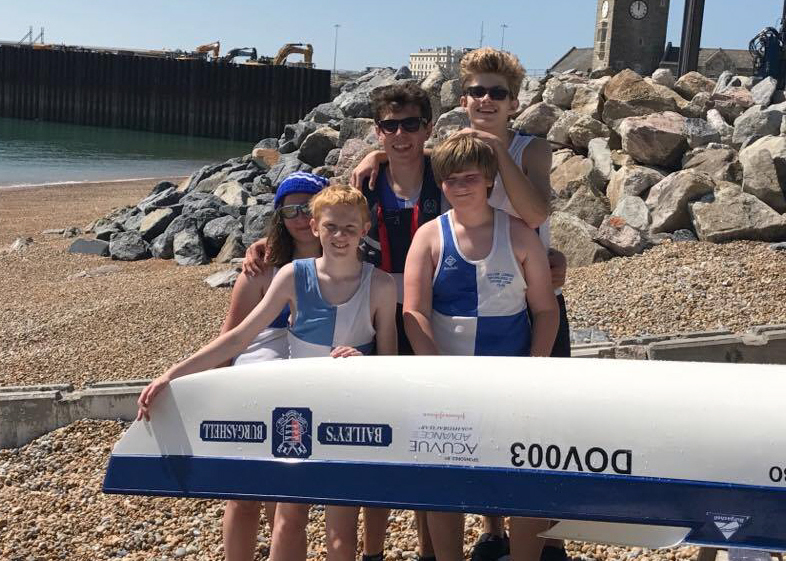 The first race saw the Dover J14 crew of Will Crickson, Rebecca Stothart, Ty Young, George Burrows coxed by Tom Stothart in their first ever race. The youngsters worked hard against older crews as they fought for 2nd place before eventually settling for an excellent 3rd. 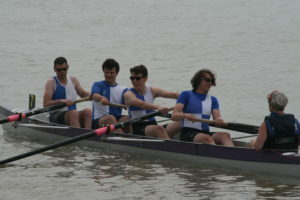 Dover’s Men’s Novice Four were the next crew to race. Jon Cook, Toby Scrivener, Guy Hadfield, T Stothart coxed by Cameron Mackintosh got a great start and soon locked in pursuit of the strong Bexhill four. The novices were unable to close the gap at the buoy turn so they pursued Bexhill on the return leg, but were unable to overhaul them coming in comfortably 2nd. The Ladies Open Sculls saw Jo Johnston, Lizzie Foley and Antonia Reed competing. The race was dominated by the Folkestone Sculler from the off which left the Dover rowers fighting within the pack for 2nd. The Scullers were all close at the turn but as they rowed the return leg they fell to the middle of the field; Johnston finishing 4th, Foley 5th and Reed 8th. Ladies Novice Four saw Claire Beaumont, Reed, Jodie Lott, Amy Lewington coxed by Mary Newcombe. A slow start saw the ladies towards the back of the race and, although the crew fought on to try and improve their position turning in 7th, they were unable to improve their placing on the return leg. 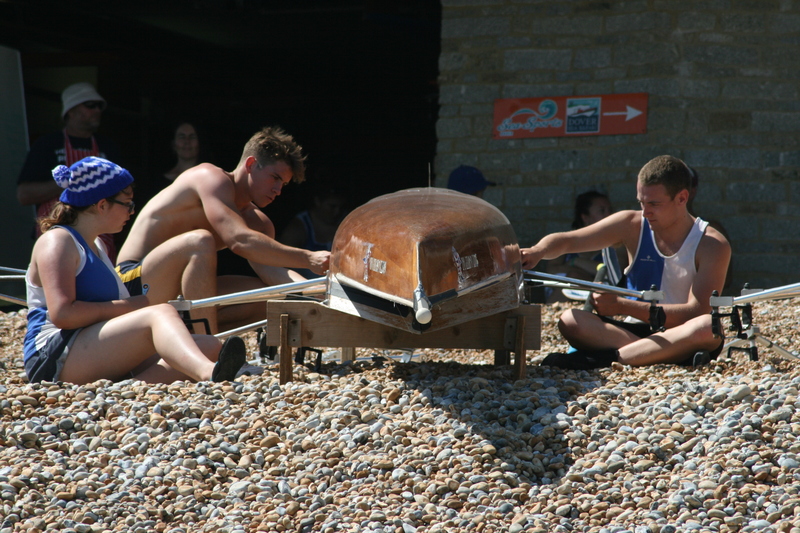 Men’s Junior Sculls saw Chris Hall and Chris Price competing. An eventful start saw Hall having to stop after a collision blocked his path leading him having to chase the field. Price’s start was more straightforward and he led Hall through the mid course buoys but was overhauled at the turn by the younger rower. Both scullers were unable to break into the top three on their return runs and had to settle for 4th and 5th respectively. A strong and experienced crew competed in the Open Veteran Fours 50+ race; Johnston, Tony Burrows, Nick Bailey, Andrew ‘Oily’ Bryant coxed by Foley. Dover’s crew shot off to an early lead holding off Herne Bay’s boat. They turned first but came under pressure in the first half the return leg where Herne Bay rowed through, leaving Dover to take 2nd place. 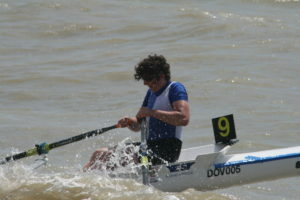 The Men’s Novice Sculls saw three Dover rowers enter the qualifying heats. 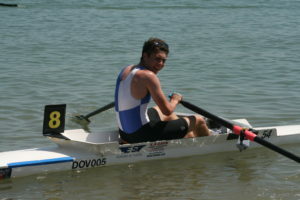 In heat one T. Stothart rowed a controlled race to maintain a qualifying position and conserve energy coming home 4th. In the second heat Mackintosh and T Burrows both struggled to maintain qualifying positions finishing 7th and 8th respectively. In the final Stothart was in the mix on the outward leg before falling back after the turns to finish 6th. 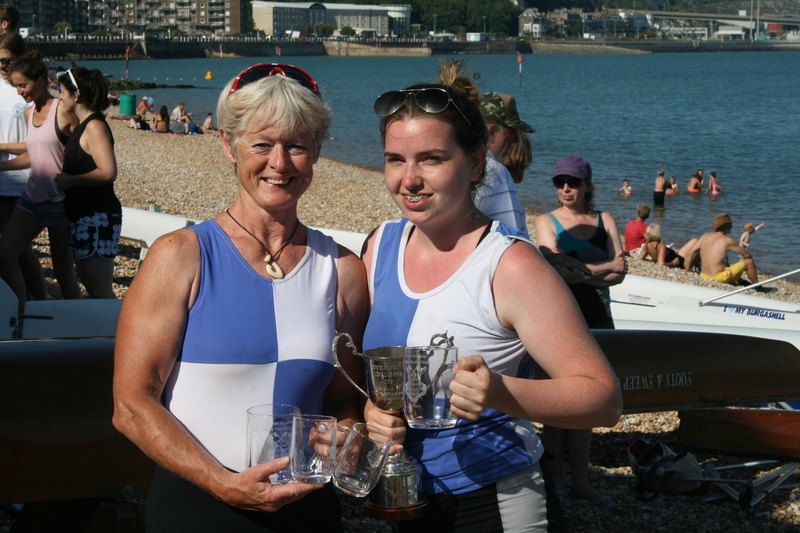 The Ladies Senior Pairs crew of Johnston and Maria West-Burrows found themselves in a straight battle with a strong Shoreham pairing from the off. Dover’s crew quickly fell into chase mode with Shoreham maintaining their early advantage. After the turn they tried to apply pressure but found Shoreham too strong. The Men’s Junior Pairs saw T. Stothart and Hall in action again. The pair had a good start and were in the fight with the leading crews. At the buoys the Dover boat turned 2nd with three other boats on their heels. In the dash back the lead boat consolidated their advantage while the Dover crew dropped to 3rd at the line. Ladies Junior Fours crew of Foley, Chrissy Purvis, West-Burrows, Newcombe with Johnston as cox had a rough ride from the start. With a large field crews bunched to get a clear run through the mid course buoys. The ladies found themselves clashing blades with two crews before being hit at the turn leaving them in 9th on the return. 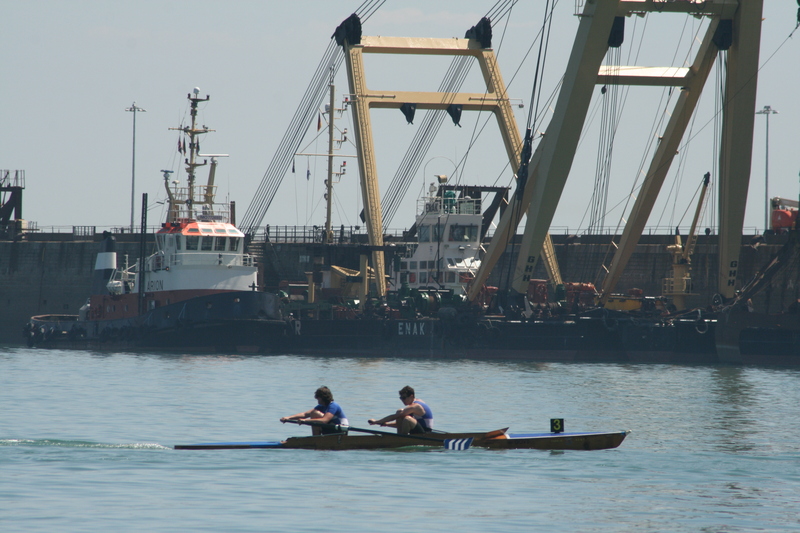 A clear run and rowing strong and long saw the Dover crew row through 5 boats to secure 4th place in a very challenging race. 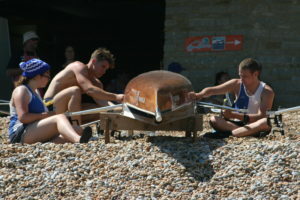 With 3 novice rowers making up the Men’s Junior 4’s boat it was going to be a challenge for the crew to be competitive. Cook, Scrivener, T. Stothart, Hall coxed by Johnston had a good start and were in the middle of the field on the outbound leg. It was only in the last quarter that their challenge fell away leaving them in 6th. Dover left the best to last as they put out three crews in the Ladies Double Sculls. Regular crew of Johnston/Newcombe were competing with new pairings of West-Burrows/R. Stothart and Lott/Reed. Johnston/Newcombe in the outside lane went out strongly with West-Burrows and J14 Stothart also moving toward the front of the field. Johnston/Newcombe turned first and found themselves racing a ferry back across the harbour as they completed an excellent day for Johnston taking the win by several lengths. West-Burrows/Stothart completed a points finish in 6th place with Lott/Reed all smiles as they finished 7th. A&S Self Storage Ltd, Andy Tibbles – A.T. Garage Services, Dover Marine Services Ltd, Dover Sea Sports Centre, Dover Water Sports, K.R. Gavin Removals, Kent Stonemason, Mariner III – Malcolm, Sharp and Enright, Riverside Catering Services, David Newman & Julie Hall,Mrs J.M. Bailey, Mr N.J. Bailey, Best Godmother Ever, George & Toni Burrows, Mr N.J. Cooke, Mr W Darlington, Mr K.C. Goodwin, Mr G Johnings, Mrs M Johnings, Mrs M. Squibb, Jane Forryan, Mr R Purvis, Mr C Townley, Miss S Walmsley-Preece, R Newcombe. 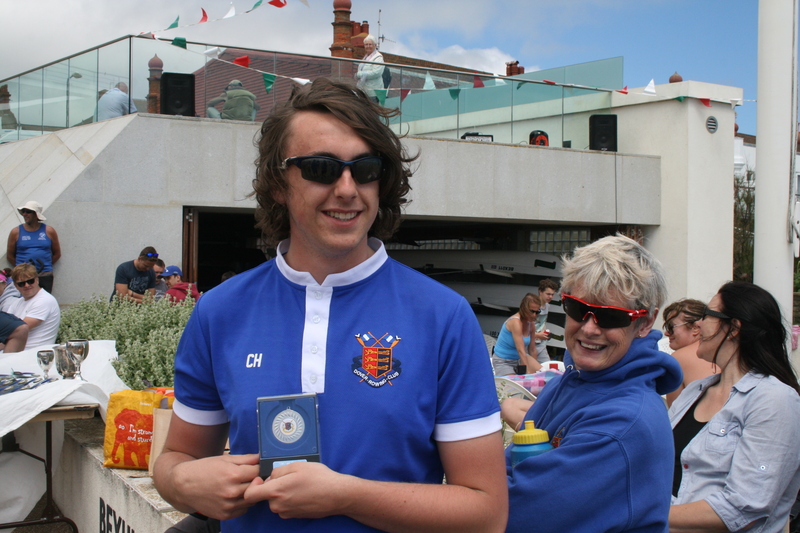 The weekend saw Dover Rowing Club in action in Bexhill for the Hastings and Bexhill Regattas. 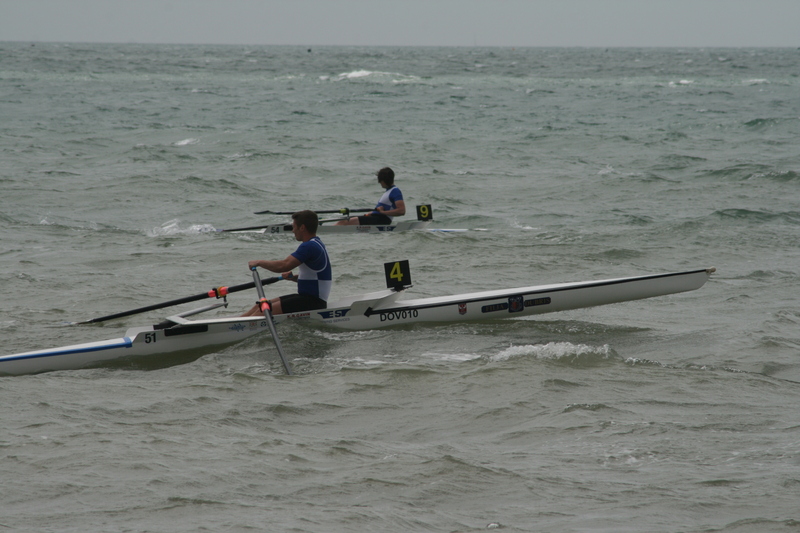 Conditions for the Hastings regatta were extremely challenging and the event was cancelled after 9 events. 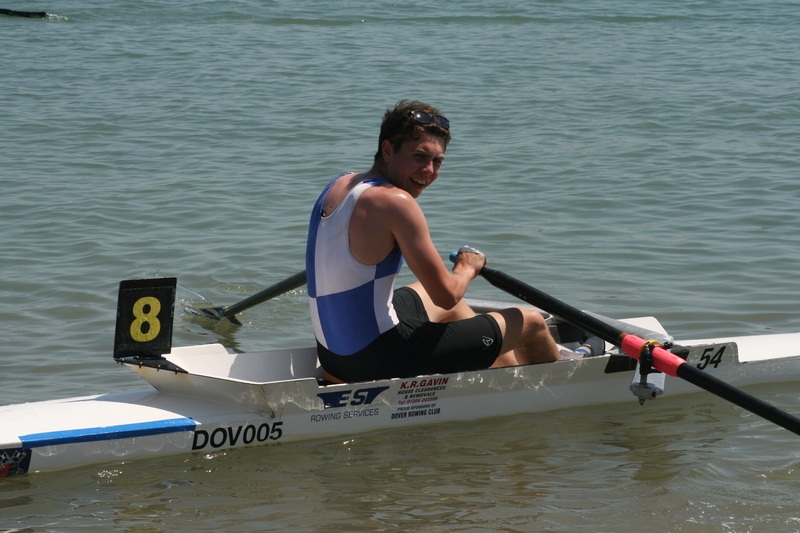 The only Dover Rowers to race were Chris Price and Chris Hall in the Men’s Junior Sculls. 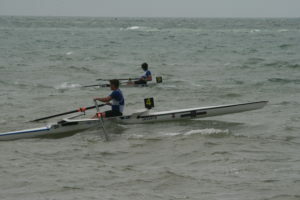 Price, a light weight rower, struggled to make progress and abandoned early, whilst Hall pushed on making the turn in 3rd place despite waves breaking over his shoulder. Hall then caught a runner out of the turn pushing him a length ahead of the home rower, an advantage that he maintained to secure 2nd place. 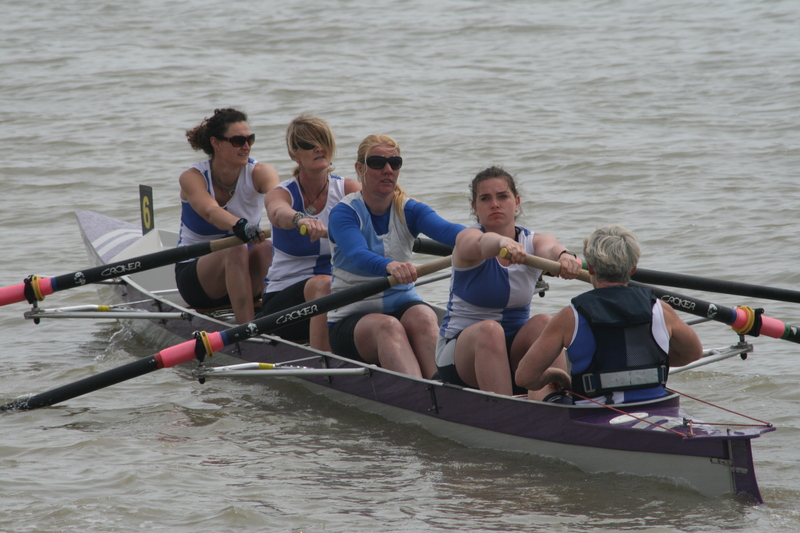 The Bexhill Regatta, on Sunday, had calm conditions throughout the day. 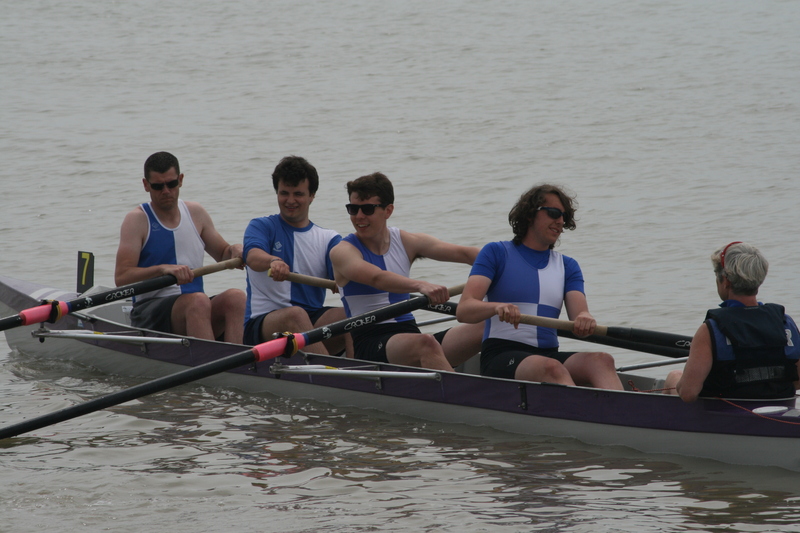 Dover’s first crew to compete was the Men’s Junior 4’s featuring disabled rower Jon Cook in his first CARA regatta where he rowed with Austin Mills, Tom Stothart, Hall and Jo Johnston coxing. 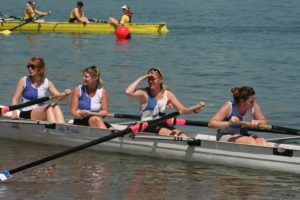 The crew, containing 3 novice rowers, competed well and overhauled a number of crews after a slow start. 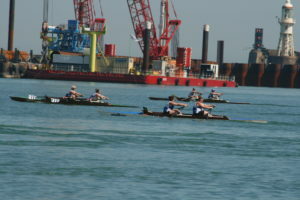 At the turn the crew moved into 4th place which they comfortably held to the finish. 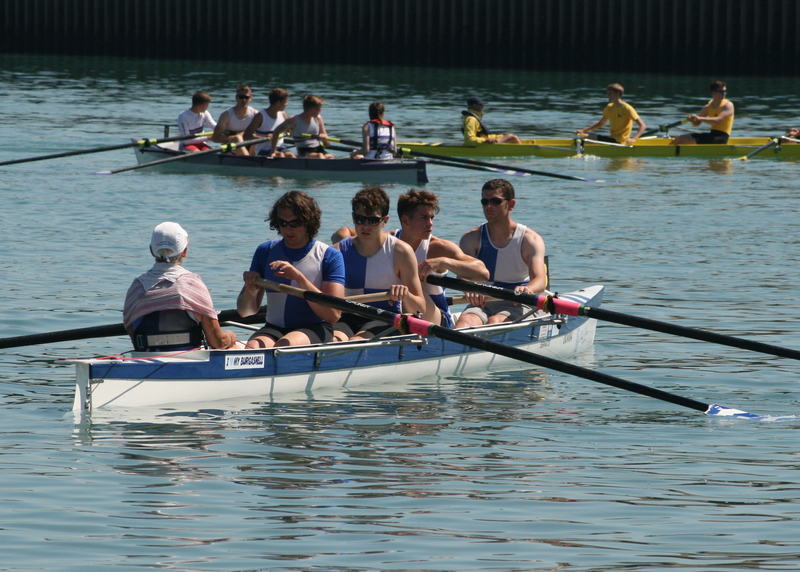 Hall’s Junior Sculls race was not without incident. 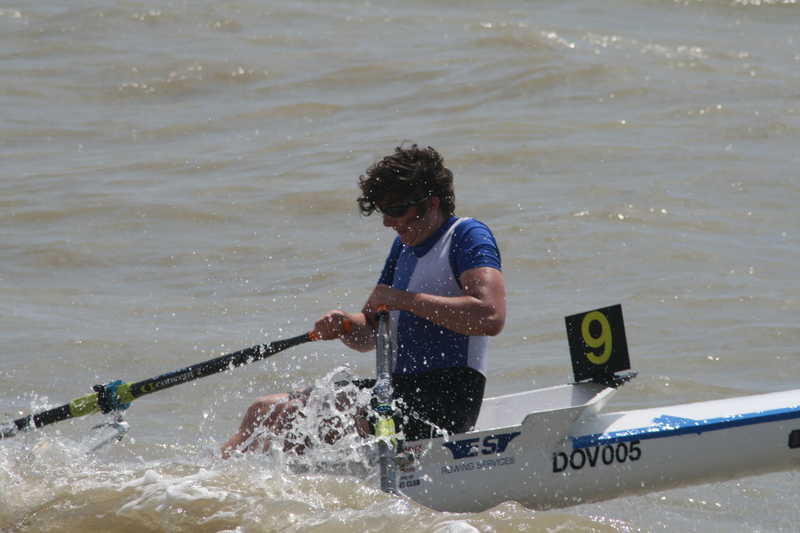 The young rower was preparing to make his push with 400m to go when the rower in front of him capsized forcing him to stop and manoeuvre around and leaving him in 5th overall. Hall then raced with Stothart in the Men’s Junior Pairs but issues with a foot plate slowed them off the start leaving them chasing the field. 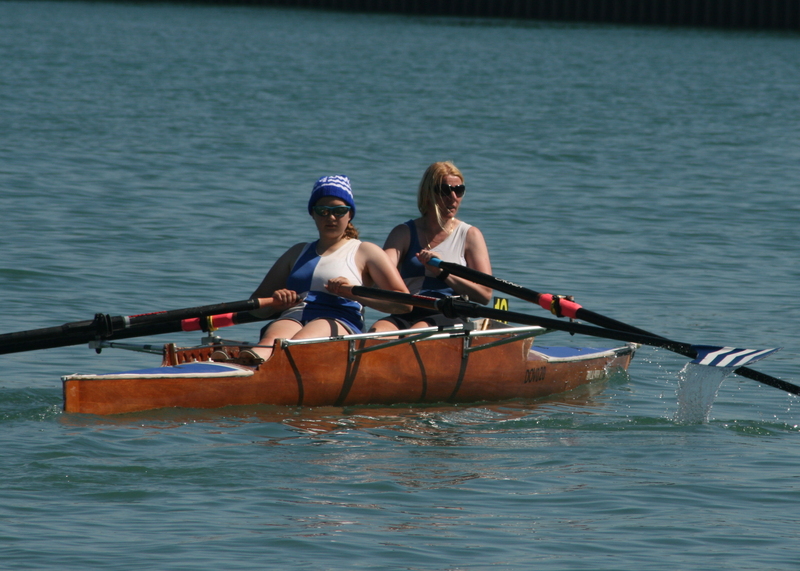 By the buoy they were battling for third with the Herne Bay pair on their inside. The race was neck and neck with the boys missing out finishing in fourth. 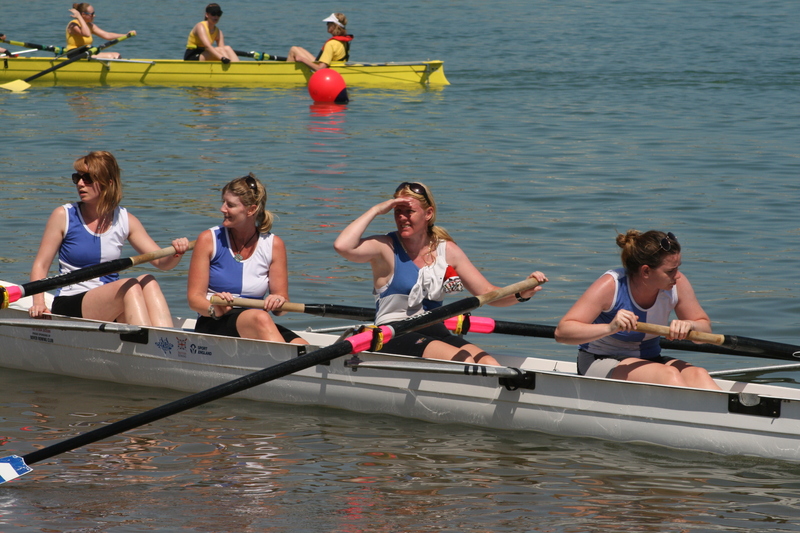 Dover’s Ladies Junior 4’s crew was Jen Jordan, Chrissy Purvis, Maria West-Burrows, Mary Newcombe coxed by Johnson. The Dover boat got off to a fine start from an outside lane and shadowed the strong Shoreham crew until the turns where Shoreham extended their lead with Dover 2nd away from the buoys. The tougher outside water gradually took its toll as the ladies crew could not hold off the boats on their inside dropping back to 4th by the finish. Dover’s Ladies Senior Pair of West-Burrows and Johnson were surprised by the quality of their field as they struggled to make headway on the outbound leg leaving them in 7th after the turn and despite their best efforts were unable to improve their position. 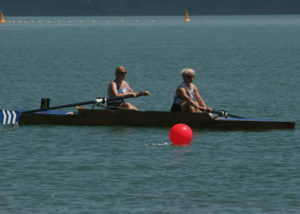 Johnson was Dover’s last Rower on the water as she competed in the Ladies Single Sculls. Johnson, who had campaigned for this event to return to full CARA status, got off to an excellent start battling a younger Shoreham opponent for the lead. Disaster struck at the 800m mark as Johnson capsized gifting the race to the Shoreham sculler. Johnson regained her poise and set off in pursuit of the other scullers moving up to 3rd after the turn but was unable to row down the 2nd place competitor.